What is it made up of and what does it look like? A backdoor progression in the key of C maj is made of an Fm7 chord to a Bb7 chord and finally to a C maj7th chord. It’s called a backdoor progression because, unlike a standard II V I resolution, it approaches the tonic chord (C maj) from Bb7th chord which is a tone below the root. A standard II V I resolution approaches the tonic chord from its dominant chord with is a G7 in this case. So you could say that V I is the frontdoor and bVII I is the backdoor. This may strike you at first as a little bit weird. Why on earth would you play a Bb7th chord in place of a G7th chord? The answer lies in the notes which make up each chord. How does the backdoor progression works ? This picture shows the chord tones which spell out a Bb7 chord and a G7 chord. It becomes clearer that the reason a Bb7 chord works in place of a G7 when resolving to a C major chord is that they share chord tones. G7 and Bb7 both have a F and a D in them which means that they will function similarly when voice leading to a C maj7th. F will fall a semitone to the E of the C maj chord (the major 3rd) and the D will fall to the C (root). Where can I find the backdoor progression and what should I play on it? 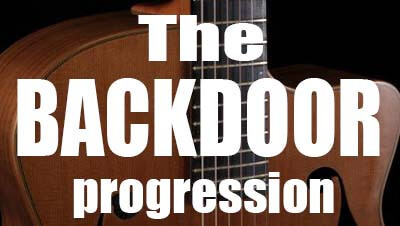 Backdoor progressions can be found in many notable jazz standards but there are a few examples which I think it may be useful for you to know about. Bars 3 and 4 of this classic standard contain a backdoor progression in the key of C major, just as in our example above. This is a great one to learn in general, but also because of this example of an accessible backdoor progression. Another classic standard with a backdoor progression in bars 3 and 4. Here we move from a C maj7th chord into a Cmin then an F7 which resolves to a G major. Finally, I leave you with an example of a backdoor progression without it’s II chord preceding it. In this case the Ab7 is the backdoor leading to Bb major. This is just as common as seeing this with it’s II chord which would be Ebmin in this case. So if you see a 7th chord which is a tone below the chord it resolves to, that is a backdoor cadence. It doesn’t always have to have a minor 7th chord in front of it. As a general rule, when you see a 7th chord that IS NOT the dominant of the tonic chord that you are resolving to, you should play the Lydian dominant scale. So in the key of C major, on the Fmin7 chord you can play a dorian scale or any other minor scale with the b7th. But on the Bb7 chord, you should play a Bb Lydian dominant scale. The only difference between this scale and a mixolydian scale that you might play on a dominant chord is the fact that it has the #11th instead of a natural 11th – E natural instead of Eb. This is why when you see a backdoor progression, it may sometimes be written as 7th #11 chord instead of just a 7th chord – so in my example from Stella By Starlight, you may see that Ab7 chord written as an Ab7#11 chord. In the spirit of the name of the website, it’s only right that I provide you with a jazz guitar lick to finish off the article. What makes this lick interesting is that I have included a few things that might seem just plain wrong, but because they are voice led strongly, they make a strong sound. On the Fmin7 chord you may notice that there is an A natural on the final quaver of the bar. This is the major 3rd of F not the minor 3rd as the chord is indicating. The reason why this works is because the A natural quickly falls to the Ab in the next bar – this is the b7th of Bb7#11. The first 5 notes of the lick imply a scale called the Bebop Dorian Scale which is an 8 note scale. This scale has both the major 3rd and the minor 3rd in it. The second part of the lick strongly implies Bb Lydian dominant as it contains an E natural (#11) and and Ab (b7th) but you may notice at the end that it resolves to the E of the Cmajor chord chromatically via an Eb. So basically this bar contains both a #11 ( E) and a natural 11th (Eb). 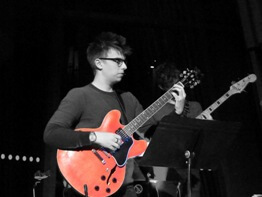 Luke Adams is a session guitarist and jazz musician based in Cardiff, Wales. He’s currently studying for a degree in Jazz Guitar from the Royal Welsh College of Music and Drama and is taught by some of the top musicians in the UK. He regularly performs around the UK with various professional projects whilst also composing original music and performing with his own contemporary jazz trio – 2alike. Luke is also a keen writer and tutor both online and in 1-1 lessons. In music, extensions are notes added beyond the seventh of basic voicings, they are used to create a more complex sound. This jazz guitar lesson provides some chord voicings with neck diagrams and formula charts to play extended major seventh chords as Cmaj9, Cmaj#11 and Cmaj13 on the guitar.